** Our present stock of large antler billets are mostly mule deer. 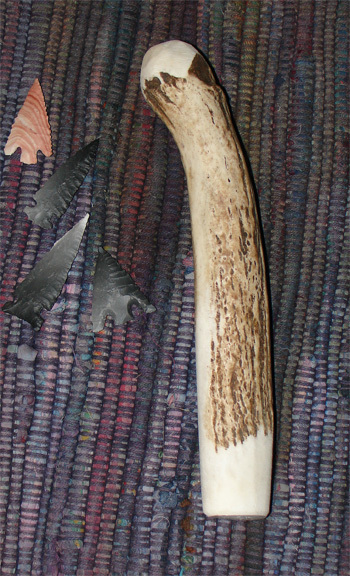 ** Finished and ready-to-use billet made of gray, white to gray-white deer antler. These may be solid base sections of mule deer antler, or they may be beam or base sections of solid Axis deer antler. Good for large flake removal on heated stone and general flintknapping. These billets weight from 9-12 ounces, and are not so large they can't be used for normal reduction. NOTICE: Antler prices nationwide have increased sharply due to the "doggie chews" market. We look for prices to increase further this year.